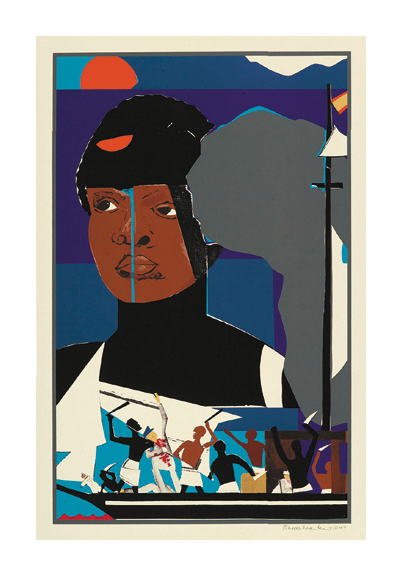 Sorcerer's Village = 1972, Serigraph. Edition 125. Signed, titled and numbered 72/125 in pencil. Image size 16 5/16 x 19 5/8 inches (414 x 498 mm); sheet size 19 3/4 x 22 1/2 inches (502 x 572 mm). A brilliant, clean impression, on heavy off-white wove paper; with full margins (1 1/2 to 2 inches), in excellent condition. 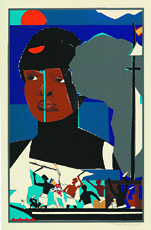 Slave Ship = 1977, Color Serigraph. Gelburd/Rosenberg 61. Edition 144. Signed, titled and numbered 91/144 in pencil. Image size 28 1/2 x 18 inches (724 x 457 mm); sheet size 30 3/4 x 20 inches (781 x 508 mm). A fine, clean impression, with fresh colors, on heavy off-white wove paper; full margins (1 to 1 1/4 inches), in excellent condition.